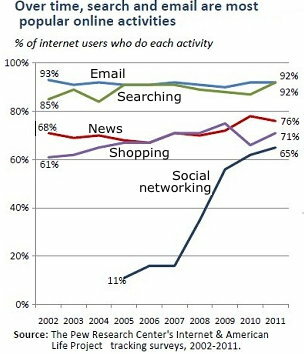 According to the Pew Internet & American Life Project in 2011 Email and Searching were the top online activities. According to Nielsen in 2011 social media represents 22.5% of the time Americans spend online. They spend 9.8% on online gaming, and just 7.6% for email. On a typical day, 43% of online adults use social networking. compared to 13% of mobile PC users. Web Developer / webmaster info.